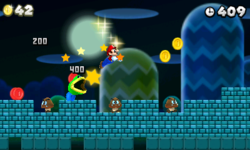 World Star -1 is the first level of World Star in New Super Mario Bros. 2. This level takes place at night. It consists of many Brick Blocks and ? Switches which can be used to make various groups of Brick Blocks rotate on a point. Goombas and Koopa Troopas are the main enemies of the stage. The Fire Flower is the main item. A unique Red Ring in the stage spawns a Coin Coffer, which will drop the eight Red Coins it holds naturally, or can be attacked to obtain them quicker. Moon Coin 1: The player needs to hit the right brick to use the P Switch. Once pressed, bridges will temporary open up, and the player needs to fall all the way down. Once down there, there is a Pipe Cannon, which shoots the player through the first Moon Coin. Moon Coin 2: The player needs to Ground Pound two rows of bricks, at the right of the Moon Coin, and then use a Koopa Shell to get it. Moon Coin 3: The player should jump down before hitting the ? Switch to get the last Moon Coin. This level is the only level where a Koopa Troopa can be put inside blocks without a way of escaping. It will glitch and go the left quickly while returned afterward. This page was last edited on April 13, 2019, at 09:02.